In Korea, there are several indications that it is fall, besides the leaves and temperatures changing. One is that roadside pungeo-bbang (붕어빵 or taiyaki in Japanese) stands start popping up again. 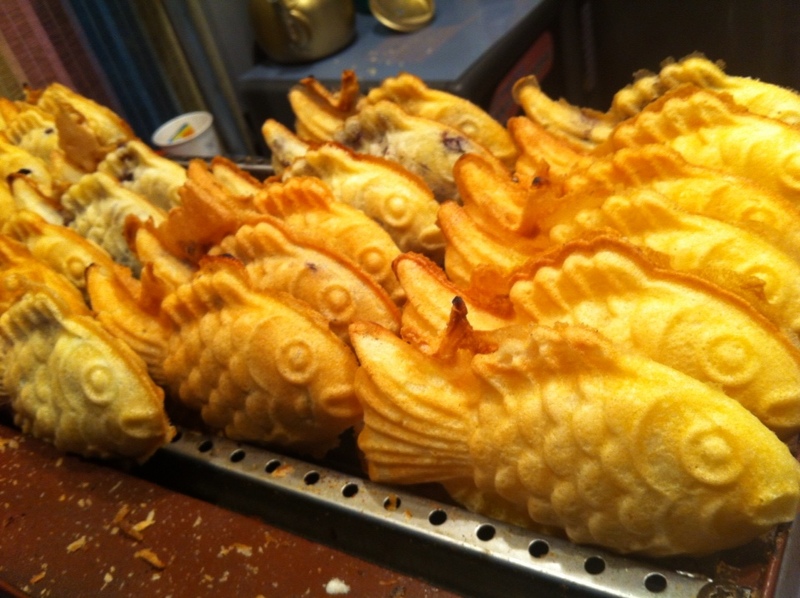 Literally, “fish bread”, they are pancake-like cakes shaped like fish, with red beans inside them. They are perfect when you’re walking home in the cold and want a quick snack. Because they are hot food, a lot of them close down during the summer (when people would rather eat patbingsu anyway). They are often surrounded by a sheet of clear plastic to keep in some heat for the poor person working there and for the people who stop to buy things. Another change in the roads are the things that are spread out to dry on them. This is more common in the countryside, where farmers spread out rice to dry on tarps, but in the city too you can see hot peppers and other things spread out wherever there is room. 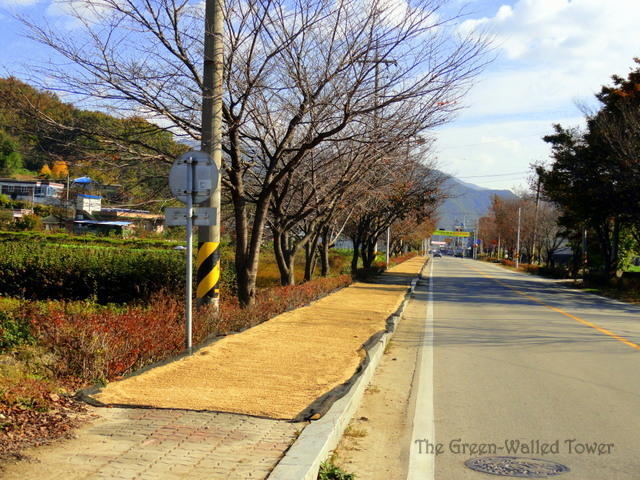 As you see, rice often takes over the sidewalk or a lane of the road. The farmers rake it to get it evenly dried, then go along with a machine to scoop it into bags. 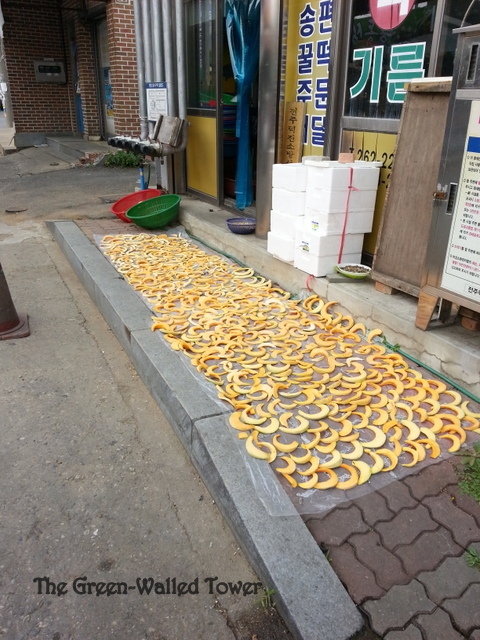 This shows the communal nature of Korean society: although I’m sure some crime exists in this area, people don’t go out at night and steal all this rice. 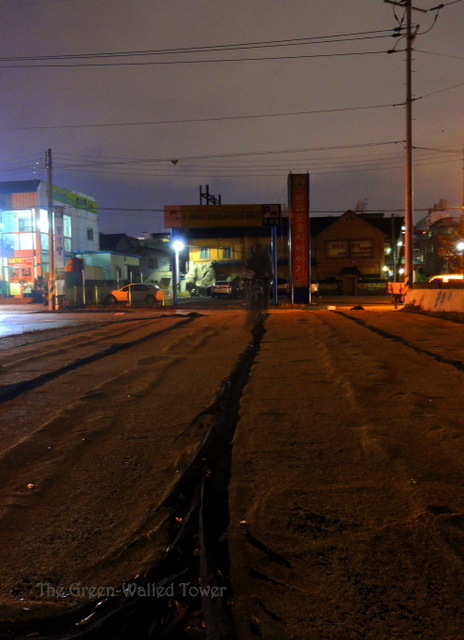 Here is several thousand dollars worth of rice spread out overnight in the provincial capital. There are other foods too that are spread out to dry. Like melons,which I saw a few days ago. 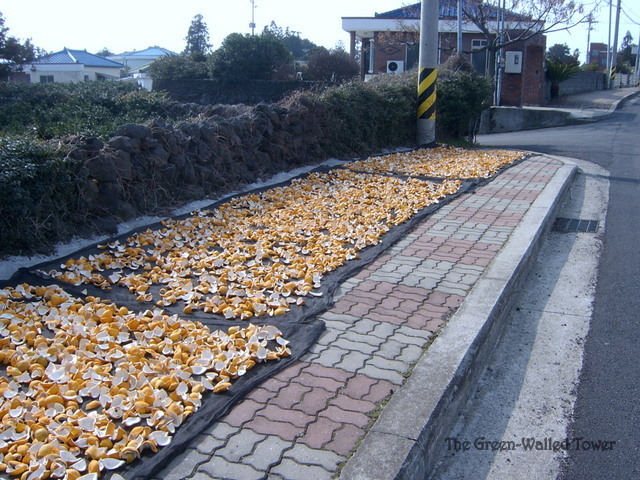 When we were on Jeju, the semi-tropical island south of mainland Korea, there were lemon peels laid out to dry by the road, I guess to make lemon tea out of. Don’t you love fall? I realize that in a country with only one or two seasons, there might not be fall like this, but if there is, what other little touches do you see in your area that show that the seasons are changing?